Anime Expo is the biggest anime convention in the nation that takes place during Fourth of July weekend. However, Europeans also have their own big anime convention during Fourth of July weekend with Japan Expo in France. One of the events held there in 2014 was the ECG Season 4 Finals, and in it was a wonderful Frozen skit featuring Elsa, Anna and Hans cosplayers and the songs “Let It Go” and “Love Is an Open Door”. 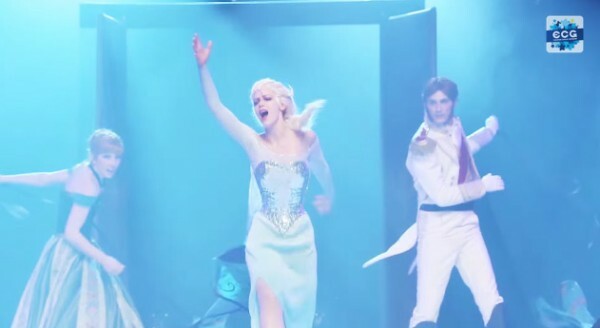 During the performance, Elsa transforms from regular Queen to the Snow Queen just like that. Enjoy!